Building awesome models is cool, but I think it is even cooler to build several awesome models that match each other in scale, let it be about train engines by depi, cars, aircraft or something else. As I rebuilt the MiG-15 and finished the Messerschmitts I knew there will be more. The new member is a Supermarine Spitfire Mark Vb. This was the last version with characteristic three-blade propeller of the early versions. This is my first plane that uses a camouflage scheme. I think the dark green-dark bluish gray combination fits it quite nicely. It required more thinking than the previous planes as not every brick I needed was available in all the colors. I decided to build the markings from bricks as long as I can, I am quite happy with this one. With a USAF or Soviet plane I would have been in more trouble. I was not happy with the existing Bf-109s either. As Dieterr89 pointed out, the wings were too narrow, especially when compared to the Spitfire. The Spitfire has a larger wing, but not by that much. The other problem was that the front section of the body was too wide. 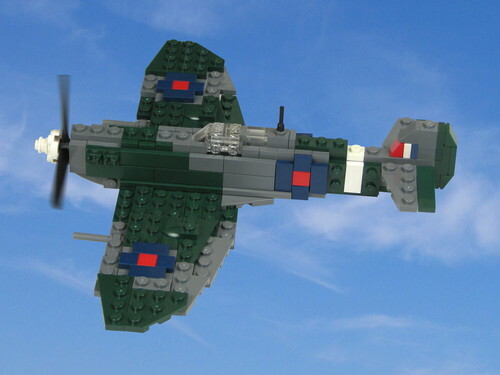 As I built the original version I was already thinking about how else can it be done, but the real inspiration came only while building the Spitfire. 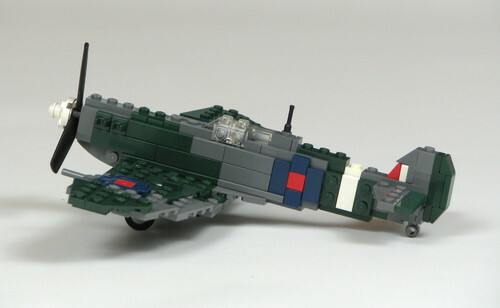 So I rebuild the Swiss and the Hungarian Bf-109 as well. This was a serious rebuild, only the tail, the nosecone and the landing gear stayed intact. The wing is a bit longer now and the fuselage has been rebuilt completely together with the canopy. I am much more content with it now. It looks like recently I need several iterations with all my models. With the Spitfire I am happy as it is, I hope it's going to stay like that.